The original oil painting is painted on hand-stretched cotton canvas, 24″x24″. My palette knife impasto painting technique creates a lively textured surface, with really thick paint. The original is no longer available. 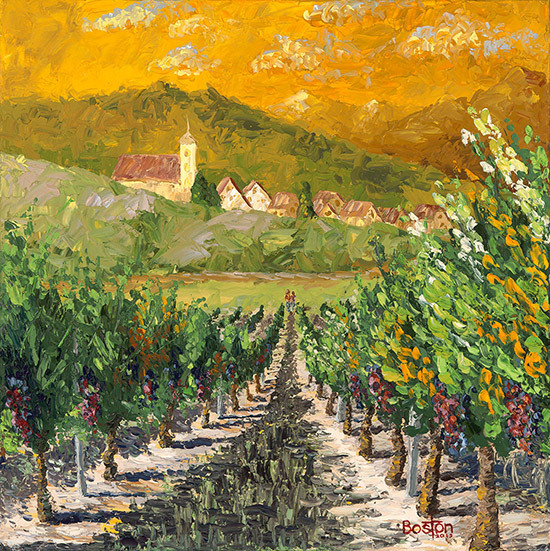 I call it Golden Vineyard, and it was painted as a gift for a gentleman who was graduating from school as a vintner. Artistically, I wanted to push the concept of how late autumn sunsets in southern France or Tuscany can have a warm haze about them, and then draw a strong focal point to the couple walking out of the long row of vines at the far end. Sort of a “mission accomplished” viewpoint of all the hard work he’s put into the education.